← Strange Adfellows for Net Neutrality: AT&T and . . . Burger King? As the hardtsking staff has previously noted, there’s ample evidence that the fabulously wealthy Sackler family, which unleashed OxyContin on an unsuspecting American public, played a key role in the country’s current opioid crisis. Their pharmaceutical company, Purdue Pharma, continues to run full-page newspaper ads – like this one in yesterday’s New York Times – pretending to give a damn. To be sure, the Sackler family has experienced some blowback lately, most notably from photographer Nan Goldin, a recovering opioid addict. 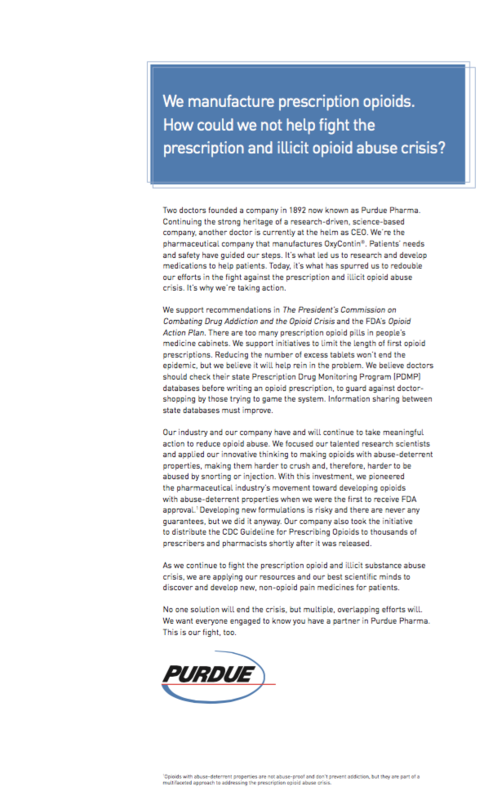 Whether that can outweigh the millions of dollars Purdue Pharma is spending on full-page ads in the New York Times and the Wall Street Journal is anyone’s guess. Just keep in mind: The untold millions of indulgences the Roman Catholic Church sold during medieval times resulted in 1) spectacular cathedrals all across Europe, and 2) the Protestant Reformation. We, however, lack faith that Purdue’s adulgences will result in any kind of reform. This entry was posted in Uncategorized and tagged adulgences, Christopher Glazek, Esquire, indulgences, Nan Goldin, New York Times, Oxycontin, Protestant Reformation, Purdue Pharma, Sackler family. Bookmark the permalink.